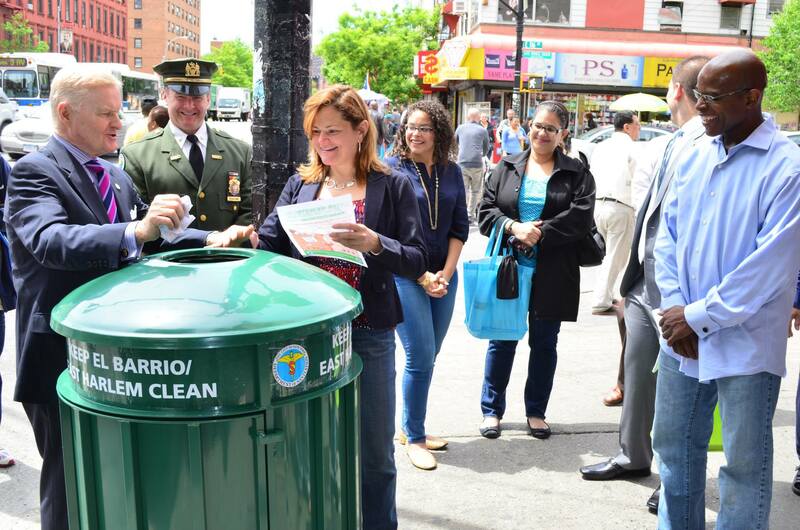 Melissa and NYC Department of Sanitation Commissioner John Doherty unveiled a set of upgraded litter baskets on 18 corners in El Barrio/East Harlem on Friday, in an effort to reduce litter along the 3rd Avenue commercial corridor. Melissa allocated $10,000 in discretionary funding in the current fiscal year to cover the cost of the baskets. The upgraded litter baskets offer 25-30% more capacity and help discourage individuals from using these public baskets to deposit commercial or household refuse. Melissa funded the litter baskets after hearing from many residents about the persistent litter problem in the community, including during neighborhood assemblies that are held annually as part of the district’s Participatory Budgeting (PB) process. We would like to thank the Sanitation Department their swift response once we brought the concerns to their attention. Check out the segment on the upgraded litter baskets on NY1. This is just the beginning of Melissa’s efforts to keep East Harlem clean. Our office will be undertaking three programs, in collaboration with the community, to discourage littering and to keep East Harlem clean. Melissa and our office are engaging in efforts to increase participation in the Department of Sanitation’s “Adopt-A-Basket” program among El Barrio/East Harlem businesses. The program is a volunteer program, in which a business, organization or individual agrees to monitor an existing DSNY litter Basket to help prevent overflowing of baskets in areas of high pedestrian traffic. The Department supplies plastic bag liners, a collection schedule and a contact person at the Department’s local district operations office. Participants change the liners when the basket is three quarters full and place the full securely tied liners next to the basket for collection. We hope that East Harlem businesses will commit to sponsor additional upgraded baskets for the community. Melissa and our office will work with a committee of concerned residents to organize a “Community Clean Sweep Day,” currently scheduled for Saturday, June 22, 2013, which will focus on key areas in the El Barrio/East Harlem neighborhood to not only sweep up litter, but to raise the visibility of anti-littering efforts. We will be moving forward with a public campaign to celebrate those who go the extra mile to keep the community clean by designating them “local heroes.” Stay tuned for more details. If you are interested in getting involved in any of these efforts and/or would like to share other ideas of how to address littering in the community, please contact us through this form. This entry was posted in Blog, East Harlem, Events and tagged Adopt-A-Basket, Clean, Community Clean Sweep Day, Department of Sanitation, DSNY, East Harlem, El Barrio, Litter, Local Heroes Campaign, Trash. Bookmark the permalink. It’s a campaign whose time has come!